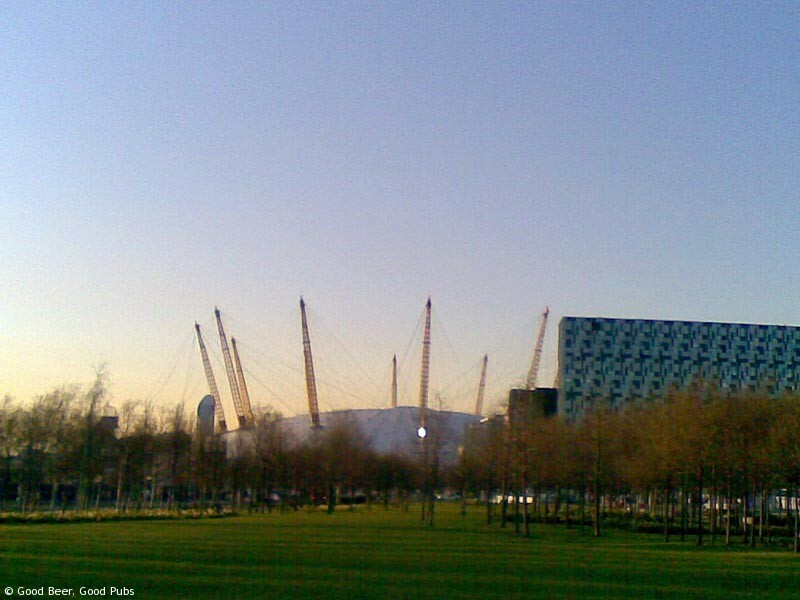 The area around The O2 (arena) is like a surreal futuristic architect’s model or marketing brochure – especially early on a Saturday morning. The sun was shining in an extremely clear blue sky, the buildings were shining in the sunlight, there was hardly anyone about and the whole atmosphere was totally serene. But of course it’s not always like that. Wind forward a few hours after a day spent at a conference in the adjacent Ravensbourne. The sun drops to the west in a still extremely blue sky. But the serenity has been replaced with multitude and excitement as hundreds of people meander about before the start of X Factor at the O2. 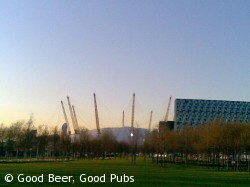 Amazingly in this area of futuristic promise and buzz there is a good old-fashioned pub nearby. 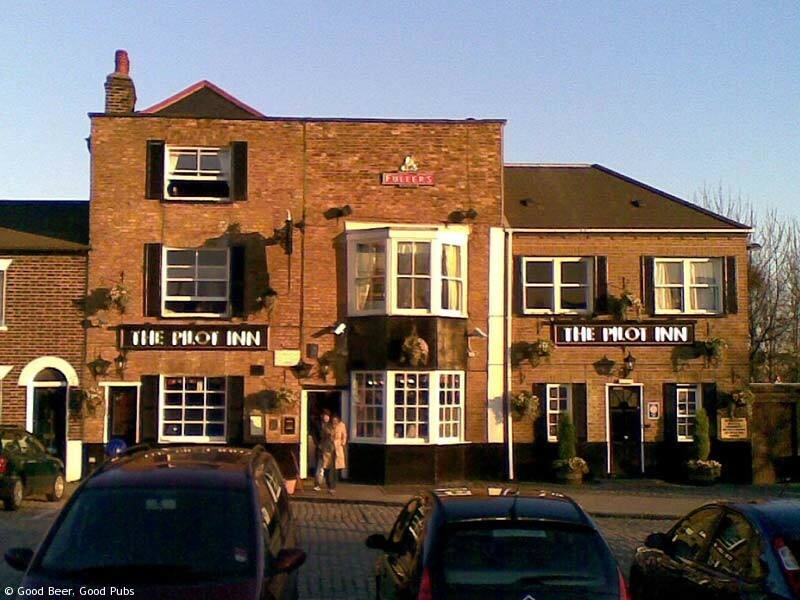 Walk south from the O2 and North Greenwich tube station (Jubilee Line), past the stretch limos, across the park and you soon come to the Pilot Inn. The Pilot In sits at one end of a short terrace of old houses – surely the only buildings more than 15 years old for some miles. The openness of the park does the pub many favours as it looks extremely welcoming – like an old friend – as you approach. In the past you probably couldn’t see the pub from a distance as there were buildings opposite. The pub is busy inside but less than you may expect given its proximity to the O2 venue – perhaps the X fActor crowd is a bit young? Inside the front door the Pilot Inn opens up with a bar along the left hand side and a seating area to the right. At the far end there are two short staircases – one up, one down to smaller seating areas. There’s a garden too out the back and further outside seating to the side of the pub. The staff are efficient and it doesn’t take long to get served. The pub is operated by Fullers and the real ale selection is mainstream Fullers choices – Chiswick, London Pride, Discovery and ESB. There are no Gales beers and no guests. Given the volume of Pride that was being sold I was disappointed at the ‘tangy’ taste of the pint I had. It wasn’t awful, but I didn’t repeat the experience. There is an extensive food menu but I didn’t stay to eat. 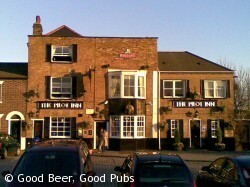 Overall, the Pilot Inn is a good pub. Given its location it could be awful but it feels friendly and homely. You’d probably only visit if attending an event as there can’t be many houses nearby. 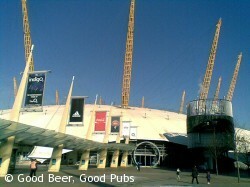 Accomodation is available and Fullers brand the pub as the place to stay for the O2.